Born first caught my eye via these very cool clogs that my sister-in-love(law) showed up to church in one Sunday. I had to compliment them and later found myself thinking about those sluggers, wondering where I could find a pair. Weeks later an add in my REALsimple mag(I know, I know, I'm so exciting) for a pair of boots grabbed my attention and I followed it back to the Born website. And then my eyes landed on THESE... and I've been hooked ever since. But can't you understand why? 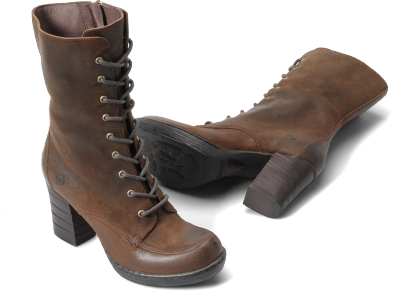 These girls are perfection for anyone who likes a rough edge to a classic, somewhat feminine boot. These remind me of the shoes we'd wear 'way back when' with our aprons and undone beauty. They make me nostalgic for a time I never knew, but often dreamed of. And the discolored suede and chunky base bring a longing for adventure. So to you, Born, I say 'thank you'. Thank you for quality, thank you for eye-catching, understated beauty, and thank you for that something special that we all long for. What fashions from the past do you appreciate? What do you wish to see come back?